HOME ESTATE AGENTS are delighted to bring to the market this fantastic period bay fronted three bedroom semi-detached property located on the very popular Rowan Avenue in Urmston. This well presented property is located close to all local amenities and only a short walk from Urmston town centre. Combining original features with a modern feel this is definitely one to view. The accommodation comprises of storm porch, entrance hallway, lounge and open plan kitchen dining room. To the ground floor are also useful cellars. 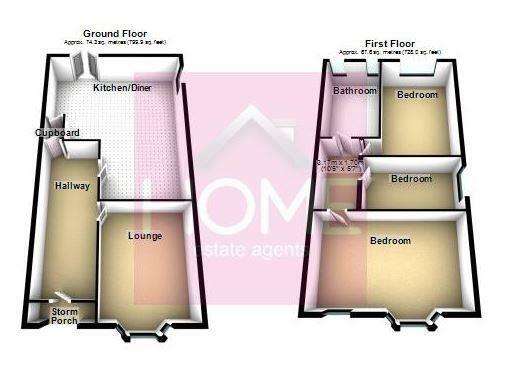 To the upstairs are three double bedrooms and a fitted family bathroom suite. The property is warmed by gas central heating. To the outside front is a walled garden and driveway leading to the rear garden. To the rear is a good sized lawned garden. To view the property on our open day please call HOME on 01617471177. Wood floor. Double panel radiator. Feature sash bay window. Wooden floor. Ornate gas fire. Double panel radiator. Two original sash windows to sides. A range of fitted wall and base units. Butcher block worktops.Breakfast island Integrated fridge. Integrated dishwasher. Tiled floor. Splash wall tiling. Floor tiling. Double panel radiator. UPVC double glazed French doors to rear. Two double panel radiators. Feature sash bay window to front. Sash window to front. Built in cupboards. Double panel radiator. Sash window to rear. Wooden floor. Built in cupboard. Double panel radiator. Sash window to rear. Built in cupboard. Double panel radiator. Two sash windows to rear. Low level WC. Pedestal wash hand basin. Bath. Splash wall tiling. Wooden floor. To the outside front is a walled garden and driveway leading to the rear garden. To the rear is a good sized lawned garden. To view the property on our open day please call HOME on 01617471177.